Selected as one of the ten best books in the mystery/suspense category for 2011 by Suspense Magazine! The quiet beauty of Longboat Key is shattered when a young groom is shot to death on the beach the day after his wedding. His father is an old army buddy of Matt Royal, and Matt tries to soften the anguish of his friend by finding his son's murderer. Matt's search takes on added complexity when there appears to be a link between this murder and three seemingly unrelated murders that occurred on board a dinner cruise on Sarasota Bay the same day. Fortunately for Matt, his old buddies, Logan Hamilton and Jock Algren, show up to cover his back and to help investigate. But this case rekindles haunting events of Matt's past and incites a web of doubt, deception, and even suspicion, among the closest of friends. When Longboat Key detective, Jennifer Diane (J.D.) Duncan joins the investigation, Matt loses a little focus as he drifts toward more than just a professional relationship. But this distraction could cost lives when they encounter a shady and very dangerous cabal . Born in Waycross, Georgia, award-winning novelist H. Terrell Griffin moved to Sanford, Florida, at the age of twelve. Upon graduation from high school, he enlisted in the U.S. Army. After three years of active duty, he began his studies at Mercer University in Macon, Georgia, where he earned degrees in history and law. A board-certified trial lawyer, Griffin practiced law in Orlando for thirty-eight years. In addition to Collateral Damage, Griffin is author of Bitter Legacy, Wyatt's Revenge, Blood Island, Murder Key, and Longboat Blues. Blood Island was named an award-winning finalist in the 2008 National Best Books Awards, Fiction and Literature: Mystery/Suspense category. 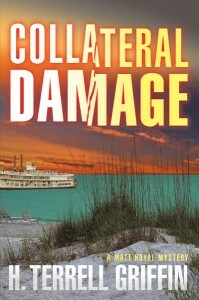 Collateral Damage, Griffin's sixth Matt Royal novel released 12/05/2011. H. Terrell ("Terry") Griffin and his wife Jean divide their time between Longboat Key, and Maitland, Florida. 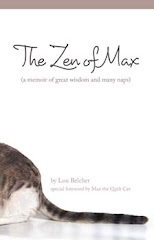 This book is getting quite the popular reviews. I think I should check it out!